Evaluating orthopedic dysfunctions in patients will be easier with Musculoskeletal Examination, Second Edition. 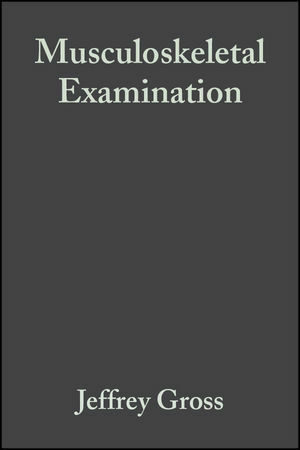 This comprehensive book is an ideal teaching and learning tool for introductory courses in physical examination. This second edition features enhanced clinically relevant examples representing frequently encountered conditions - all from a multi-disciplined perspective. Readers get the most up-to-date information in a completely new chapter on TMJ, revised chapters on gait, posture and structural examination and new and improved illustrations. Jeffrey Gross and Joseph Fetto are the authors of Musculoskeletal Examination, 2nd Edition, published by Wiley. Chapter 2 Basic Concepts of Physical Examination. Chapter 3 Overview of the Spine and Pelvis. Chapter 4 The Cervical Spine and Thoracic Spine. Chapter 5 The Temporomandibular Joint. Chapter 6 The Lumbosacral Spine. Chapter 7 Overview of the Upper Extremity. Chapter 10 The Wrist and Hand. Chapter 13 The Ankle and Foot.